I’ve sometimes been critical of “our side” with regard to leveraging the Internet and Web 2.0 communications to get the word out. I definitely include myself in that part of “our side” that needs to do a better job communicating the truth as effectively (if not more effectively) than the BDSers spread their lies. But an excellent new project just kicked off by the Israel on Campus Coalition (or ICC – a group of pro-Israel groups working in schools and on college campuses) demonstrates just how good an Internet-based political resource can be. Simply put, Ask Herzl – a site dedicated to providing students a central repository for information on campus-based pro-Israel programming – is probably the best activist resource site I’ve ever seen. 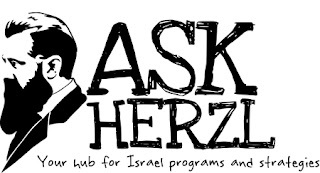 Ask Herzl includes descriptions, documentation, time and cost estimates and virtually anything else a campus group might need to implement a pro-Israel program or event (many of which have already been proven out on other campuses). Given that the site includes references for hundreds of different activities, their search functionality is well implemented, and their use of social media tools to expand the reach of Herzl is well integrated and top drawer (leveraging the latest “hot” social networks like Google + and Pintrest – sites still little understood or used by many of us “old fogeys” who can barely keep our Facebook pages up to date). I’m proud to say that Divest This material has a home in their sections devoted to BDS, and I’ve been told that this iteration of the site is just the beginning – which I believe given the many access points Herzl provides students to submit their own successful program materials (as well as participate in various grant and scholarship activities). Some may kvetch that the programming included on the site tends to focus on education and outreach (vs. attack-based programming targeting Israel’s critics), but I believe this is simply a reflection of what students are most comfortable with regarding how they want to interact with “undecideds” on campuses. And since it’s never been proven that aggressive activities such as “mock walls” or “Israel Apartheid Week” do anything but alienate such undecideds, the focus of Ask Herzl seems to reflect the opinion of most pro-Israel student groups to not get into people’s faces. Ask Herzl certainly doesn’t solve all of our online partisan problems. As I’ve noted before, one of the other side’s key strengths has nothing to do with cutting edge high tech, but is simply a result of their willingness to spend time running around the Internet liking and linking everything that supports their BS in order to drive those stories up the search rankings. But projects like the ICC’s Herzl site is centered on building connections, and in addition to letting students struggling with campus-based Israel hatred know that they are not alone, one hopes that it will foster a community where most if not all of our low and high-tech communication challenges can eventually be solved. So Bravo to ICC, and if you’ve got any questions: just Ask Herzl! Glad to hear Ask Herzl is worth while. I have received info about it, but have not had time to explore the site.